We love your bows, fashionable quality @ an affordable price. The very best around. Ordered my first shipment from the UK for my 4 month old Shih Tzu Buddy. Fantastic high quality bows, so well made and amazing designs, very quick shipping to the UK, received just over a week of ordering. Both family and friends have all commented how cute Buddy looks in his new bows. Will be making another order soon. These bows are amazing. I used to show dogs and wish I would have found her then. It was difficult to get beautiful bows that held up. These are even more beautiful in person. The quality of the workmanship is top notch. PLEASE do not hesitate to have her make all of your bows. They are worth every penny!!!! Thank you so much. Bentley will be in style for all occasions. I've been ordering bows online for years....I just got my first shipment from bowbizdogbows ..
look great online... and awesome in person! Edited to add: OK, it didn't seem right NOT to show off Stew's new bow!! Hi Susan, just wanted to let you know that I received Emma's bows a few days ago and I just LOVE them!! The very first day we received them, we were having a dinner party at our house so Emma got to wear one of the mini-korker bows. It looked sooo cute on her. I just love your bows...they are so well made and beautiful. I can't wait to order more. 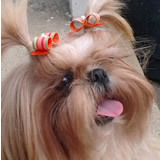 My name is Felipe and this is my gorgeous Shih Tzu named Keiko, this is the first time I bough bow from you and I have to say that I love your work, I love every single bow I got from you and I decide to send you this picture for you. I hope you like it. PS - I think my little girl Mia is ready to start wearing bows from your collection tiny bows, I tried this cupcake bow the other day, and I think she looks adorable. I can't wait to place my next order! I received Mya's bows today and they are absolutely gorgeous! I love them. I can't wait to place my next order! 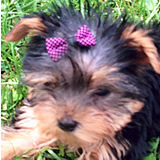 Here is Mya at 9 weeks sporting her first BowBiz bow! She is officially in bow training! Thank you so much! The quality is superb, excellent communication, and fast shipping! I love forward to MANY future purchases with you! I will be a customer forever!! I am writing to let you know how pleased I am with your bows. They are beautiful, and well made. They are so much better than what I was expecting. I will be a customer forever!! Thanks for making my baby Piper look even more beautiful!! I just received my order of bows and I wanted to Thank You for the high quality bows, your work and effort you put into my order. I can tell that you take time and pride in your work, and absolutely love the quality! Thank you for the excellent service I will defiantly order again from you in the future and will share your information with others. Thank you so much!! Irena and Fendi. I received the bows today in excellent condition. I have attached a picture of Darcy in her new Star of David bow. I wanted to see her in it before Hanukkah at the end of November. The bow will be her special holiday bow. I have other Star of David bows but non as lovely as yours. PS - I placed another order for bows last night. Again, your bows are beautiful. I have placed bow orders with other companies and have been unhappy with the bows. Now I have found you Darcy will only wear Bowbiz bows. Thank you so much for the beautiful bows. We are so happy we found you and will spread the word among our small dog owners. 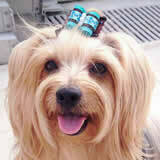 I just ordered more mini korkers, they look so cute in our Tasha's hair. Thank you for making such quality bows! ecstatic that I've found your bows!! 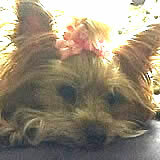 I thought I'd try from work to attach a picture of Moxie with two of her bows in. She is an 11 pound Shih Tzu in the process of growing out to a full coat. I am absolutely ecstatic that I've found your bows!! They...are..AMAZING. I can't believe how sturdy they are! I don't know what I was expecting but it definitely wasn't these..these are stellar! I think I expected softy floppy bows...the picture doesn't do them justice. They're just beautiful ... thank you again, they are fabulous! She doesn't have enough hair up there to use the bands, but the ones with clips on the backs are working great!! She can wear the others when she's grown a bit more. ordered bows from you a long time ago and they are still looking great ! will put in another order soon! 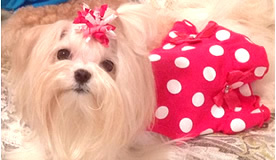 here is a picture of coffee from sunny singapore rocking bow biz bows!